Home > Aventuras Log > We are sailing! 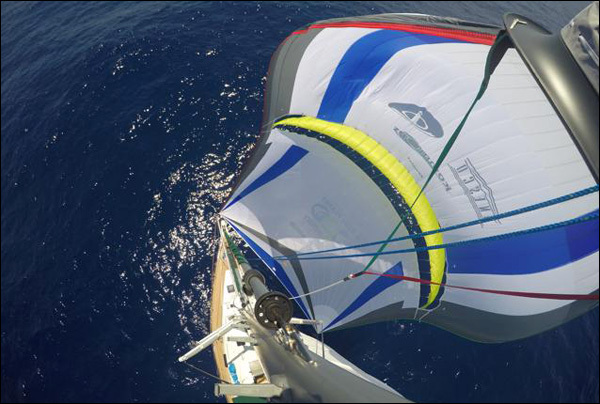 After several days of calms and very light winds, something that I had never experienced in the Caribbean Sea before, the wind finally came up… as did our Parasailor spinnaker. Dave could not resist the temptation to film and take some photos of the colourful sail, so we hoisted him to the top of the mast. The major attraction of this special design is that it acts both as a classic tri-radial spinnaker and also doubles up as an asymmetric. 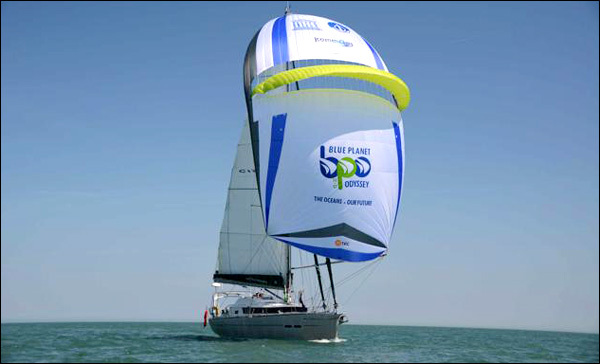 The main features of the Parasailor are the wide slot that runs from side to side about one third down from the top, and a wing below the slot, on the forward side of the sail. 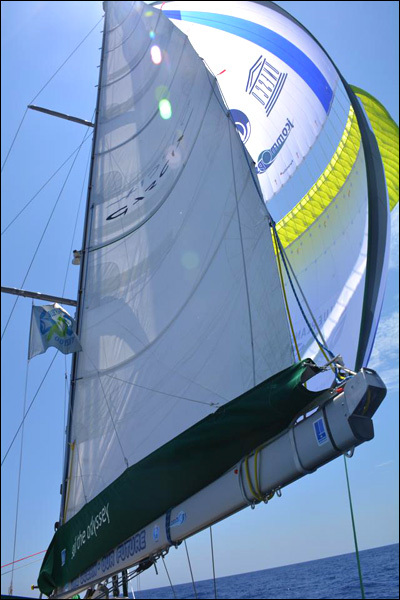 Once up and poled out, the Parasailor acts just like a normal tri-radial spinnaker but this is an illusion as the slot and wing help the Parasailor stay full even in light winds. I have used it on a few occasions in as little as 5 knots of true wind, and every time it looked like collapsing the back pressure exerted by the slot kept it full. It is in strong winds, however, that the Parasailor comes into its own. 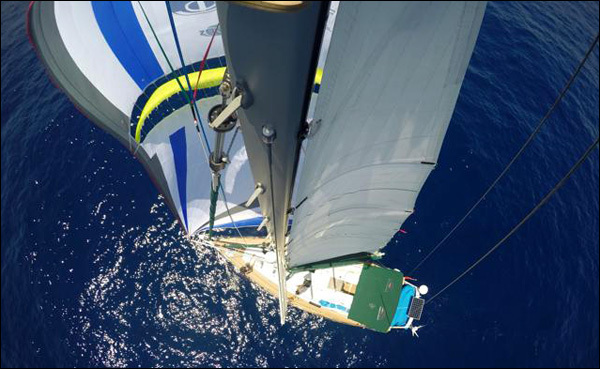 Normally I drop the spinnaker when the wind reaches 15 to 17 knots true, but on one occasion, on the way from New Zealand to New Caledonia on Aventura III, when I saw a squall approaching, I decided to leave it up and see what happened. From 15 knots the wind went up and up and settled at 27 knots. Aventura took it all in her stride, accelerated to nine, then ten knots and once, when it caught the right wave, surged to fourteen. Meanwhile the Parasailor behaved as normally as before, the wing streaming ahead and the slot wide open almost visibly spilling the wind. 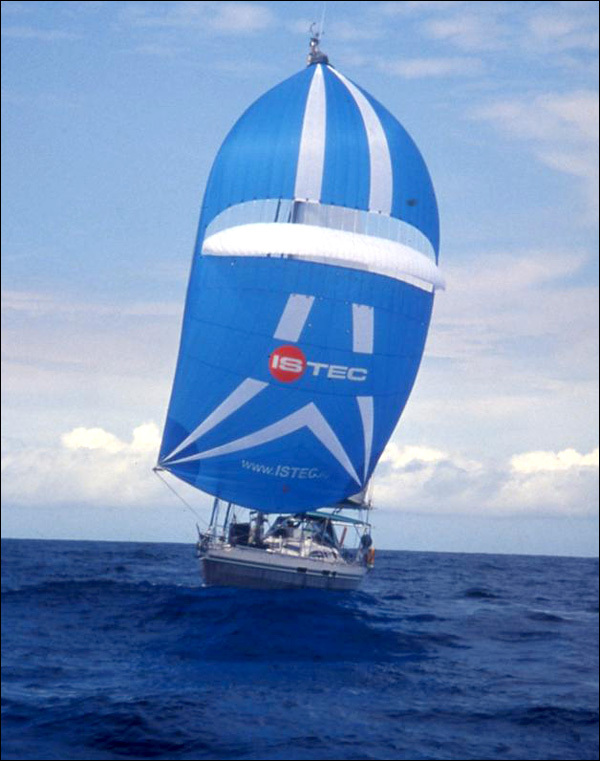 That was in 2004, and the new Parasailor almost missed us as it arrived in Auckland on the day of our departure. I had met the inventor at the Dusseldorf boat show, when he described his revolutionary new design inspired by the paraglider. It sounded almost too good to be true, and although I already had three spinnakers onboard: a tri-radial and two asymmetrics, I decided to try out his “Wunderkind”. 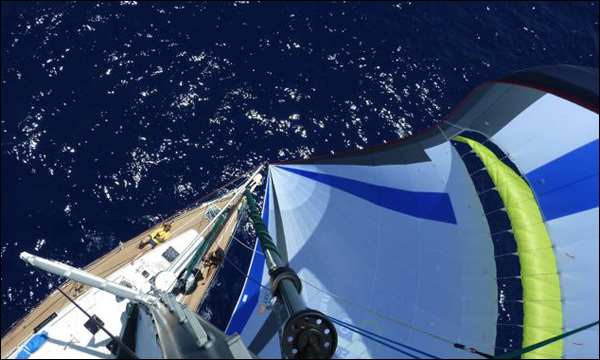 When broad-reaching, I normally keep the Parasailor fully poled out until we are sailing at 110 degrees off the wind, then, if the wind continues moving forward of the beam, I gradually ease the pole until it is about to touch the forestay. This was the case yesterday when we were beam-reaching. To make handling of the large sail easier, especially as I often like to do all work on my own, I always use a fixed pole. 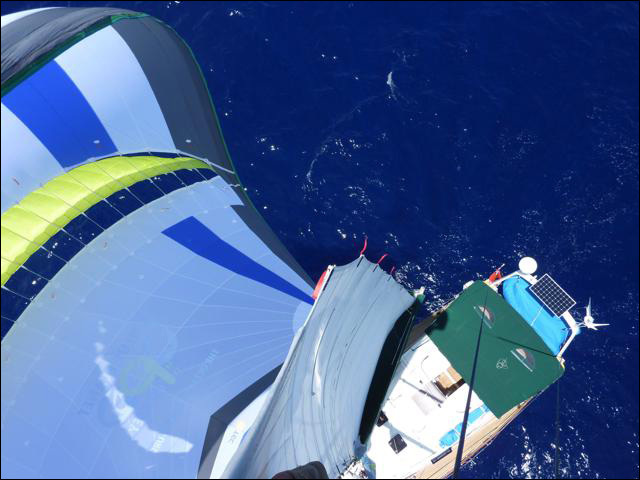 The pole is held in place by a topping lift, downhaul and outhaul or vang, the spinnaker sheet running through the jaws of the pole, with all lines being controlled from the cockpit. I hope it is very clear from this that I am happy with the Parasailor and would recommend it to anyone who is considering buying a new spinnaker. 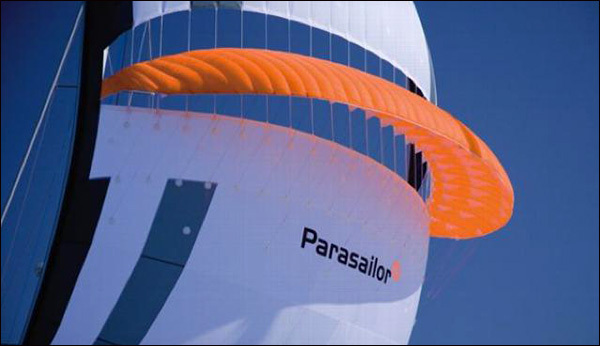 The Parasailor is produced by ISTEC, a German company that is one of the largest manufacturers of paragliders in the world. One further advantage of the Parasailor is that it tends to stay full even if not perfectly set, so one does not have to constantly adjust sheets and guys, a chore that will not be missed by a lazy crew.